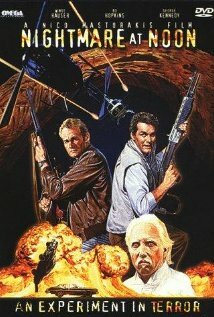 What It’s About: A mysterious albino (Brion James) and his goon squad arrive at a small southwestern town and infect the water supply with a virus that turns its victims into green blooded homicidal maniacs who will use anything-cars, guns, knives, fists-to attack everyone around them. At the same time Ken Griffiths (Wings Hauser), is a yuppie music lawyer traveling with his wife Cheri (Kimberly Beck) in their Winnebago. They pick up a hitchhiker with a past named Reilly (Bo Hopkins) and stop for breakfast at the local diner. One crazed redneck later, they find themselves helping Sheriff Hanks (George Kennedy) deal with the increasingly violent residents of the town. Can the unlikely heroes figure out what’s going on and stop it before the town goes up in flames? Why Watch it Today? : Wings Hauser, who seems born (on this date in 1947) to play jerks, pulls off the neat trick of playing a *heroic* yuppie jerk in this bizarre Action/Horror/Western from the late 80s glory days of movies intended for the cable and VHS market. I’ve mixed feelings on today’s film, but I would definitely recommend streaming the movie for the gloriously cheesy first two/thirds and then perhaps skipping the final confrontation and going straight to the end. Read more in my full review here. This entry was posted in Action, Disaster, Horror, Independent, Movie of the Day, Remake, Sci-Fi, So-Bad-It's-Good, Western, Zombies and tagged albinos, Bo Hopkins, Brion James, drifter, Drive-In, ex-cop, George Kennedy, Hans Zimmer, helicopter, hitchhiking, intelligent zombies, Kimberly Beck, lawyers, motor home, rip-off, scientists, sheriff, tool using zombies, vigilantes, virus zombies, Wings Hauser, yuppies. I never ran into this in the pre-internet age, but it would have been prefect to stumble on to on cable with my dad and brother.